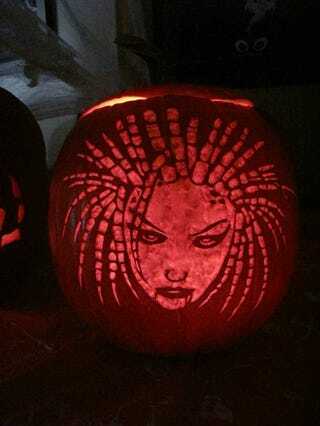 Beenox's pumpkin carving contest included this wonderful Starcraft creation. An Angry bird and &)@!ing pig pumking from reader Tom P.
Pacman pumpkins by Kotaku reader Jason. Capcom's Seth Killian made into a Seth Zombkin. Seth Zombkin being persued by Dead Rising 2's Chuck! Master Chief's Bubble Shield pumpkin as seen on Halo Waypoint. Reader the_saint's Kirby Epic pumpkin.